If you are a homeowner, you have a lot of pain about your new responsibilities. Of course, some of these responsibilities are universal to anyone, who wants to keep their home clean and fresh. Even apartment dwellers must clean their floors occasionally. So, let’s start from your floor! With this in mind, it is absolutely essential to learn how to clean and maintain your laminate floors properly. Do you want to know how to restore laminate flooring? The process isn’t fun, but there are a few tips, which can make it easier and more effective. Here is What You Need to Restore Your Laminate. Speaking about laminate floor, you cannot just scrub it. This will help, but you’ll also need some supplies and cleaning products. If you want you can make your own cleaning solution. Here what you need for cleaning your laminate floor. If you really want to know how to restore laminate flooring, prevent pollution! In order to keep your laminate floors looking great, you should first take steps to prevent them from being dirtied in the first place! Although laminate isn’t as easy to dirty up as carpet, you should still make sure that always take your shoes off, before entering your home. This simple jest will prevent tracking mud, dirt and other debris onto the laminate. You should also realize that sand and stones could get stuck in your shoes as much as your high heels. So, don’t forget to take your shoes off! Also, you shouldn’t forget to place a rug or matt at the front door. It’s for your guests who aren’t going to be so responsible and clean their shoes. Giving them a rug will encourage them to wipe off their feet, before entering your home. Finally, you should make sure to protect your floors, by using runners or rubber stoppers on the bottom of furniture. This will help to prevent your laminate from being scratched or damaged in any way. When wiping up a spill, you should make sure to use a homemade natural cleaner. This combination will not only keep your home clean of dirt, but it’ll also prevent exposing your family and pets to harmful chemicals. Also, you should consider using a microfiber pad, NOT A BRUSH when cleaning your floors without chemicals. The microfiber cloth will be extra soft and will not damage the laminate. When forced to dry clean the floors, you will usually be able to get by with using a vacuum. 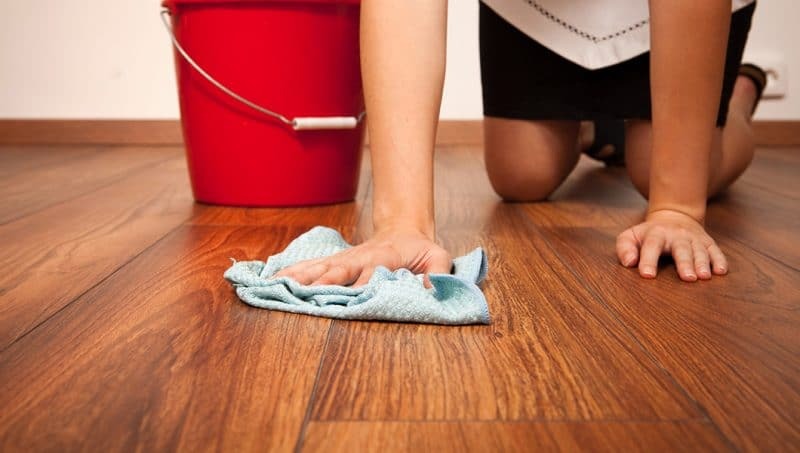 See, it is not difficult to keep your laminate floors perfectly clean, you should make sure to get into the habit of cleaning them every day! Vacuuming and sweeping is absolutely possible! Just be careful! Using a flat cloth mop and a very mild spray cleaning solution each day is highly recommended. This will help to lift the dirt and debris from the laminate, without difficulty. Also, you might want to find and utilize the best vacuum for hardwood floor! This will give you the ability to quickly clean up food crumbs and other items, when needed. Restoration needs special skills. Do you want to know how to restore laminate flooring? If you want to do it quickly you can hire a professional service or try to do it on your own. Let’s see! In order to take the task on your own shoulders, you’ll need to equip yourself with the appropriate supplies. Although you can rush out to your local store and purchase some type of floor cleaner, you might want to consider making your own. Don’t worry, because you won’t need a lot of supplies. In fact, it is possible to throw together some water and a small amount of vinegar. This magic combination can be added to a spray bottle and can effectively clean your laminate floors. Once you’ve finished cleaning the floor with the mop, you will want to make sure to clean the floors with a soft cloth or microfiber cloth. Make sure that you remove all of the standing water, because it could cause damage to your laminate. Another effective chemical for restoring your laminate floors is hand soap and even baby shampoo! This might sound like a joke, but the baby shampoo can work perfectly and will make your laminate floors look bright and clean! This is one of the best pieces of advice you could ever find for proper laminate floor care! Try it! Eventually, you’ll have your floors looking great, but you’ll want to give them a great little shine too. In order to make this happen, you need to vacuum the floor first to remove dirt and dust. It is very important to begin by removing the dirt and dust from your floors. 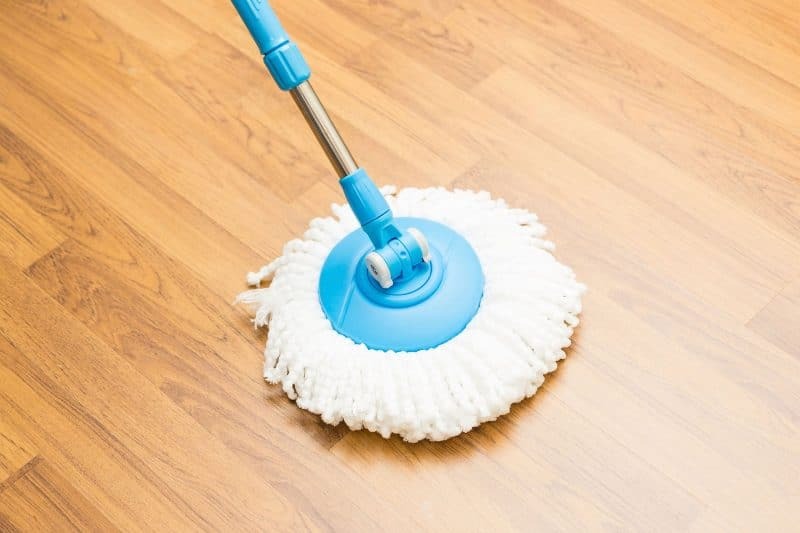 Once you’ve gotten them free of debris, you’ll want to begin removing any residue that has attached itself to your laminate floors. You also need to grab some vinegar and mop-on floor wax. Through repeated cleaning with the vinegar, you will eventually be able to uncover the shine that has been hidden, by dirt and residue. Once you’ve gotten this completed, you need to top it off, with the mop and wax. Make sure that you take your time and generously spread the wax thoroughly on your floors. This will help to make your laminate floors shine bright, as if they’re brand new! As you can see, the process of cleaning and restoring your laminate floor doesn’t need extra steps from you. You don’t need specific equipment and ingredients. From the other hand, the process isn’t fun or exciting! Thus, the tips that you’ve just read will undoubtedly be able to help you. Remember that proper care for your floors begins with prevention. Taking off your shoes and encouraging your guests to do the same is absolutely vital! From there, it is all about persistence, patience and using the right supplies! Again, looking for how to restore laminate flooring, you can always ask for professional help. Professional cleaning team does everything they should to restore your laminate, but twice faster than you can do that DIY.